The Roman Legions were renowned for their brutal, efficient use of the short sword. Over the centuries the style of short sword changed as tactics changed or were refined. Beginning with the "gladius Hispaniensis" (based on a late survivor of a La Téne II type sword: a medium length weapon that was held in favor by Celt-Iberian warriors, while abandoned elsewhere), over time the sword became shorter and broader (the Mainz and Fulham patterns) and culminated in the "Pompeii" style stabbing sword. The Pompeii pattern was a major departure in shape from the earlier styles of the Roman short sword. The outline is much more simple than the older types with their broad and often waisted outlines. The classic Pompeii blade has edges that are almost parallel, sometimes with only a subtle hint of a waist remaining. On well preserved examples of good quality the point is reinforced and hollow ground. Combined, these features makes the Pompeii pattern a mature design, that has reduced the strong features of earlier types and brought forth a much more focused shape that strongly brings out the virtues of the short roman sword: a compact blade capable of devastating cuts and piercing thrusts perfectly adapted for volume production to the legions. An almost fail proof design concept. Finds of original swords and depictions in art shows that the Pompeii type sword was used from around year 50 AD and into the early years of the 3rd C AD (although the classic shape was abandoned a bit earlier than that). A famous find that defined the name of the type were the swords found at the excavations at Pompeii. As these four swords must have been made before AD 79, when Pompeii was buried in volcanic ash, they have been tentatively dated to around 64 AD. 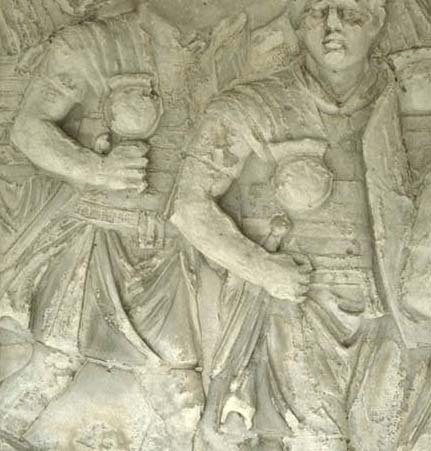 A prominent depiction in art right at the height of its popularity of use is the scenes sculpted on Trajan´s Column; a marble sculptural monument built to celebrate the victories of Emperor Trajan (98 - 117 CE) in the Dacian Wars (101-102 AD and 105-106 AD). Almost all of the Roman swords shown are of the Pompeii type. Though the Pompeii is a smaller cousin of its predecessors, it is still an surprisingly efficient cutting sword, despite its seemingly plain blade. Its humble outline is the result of cleverly balancing overall size, mass and cross section, so that the resulting edge geometry, distribution of mass and sturdiness of the point makes it a supremely dependable side arm in the press of battle. The rigid spine and pleasant heft provides enough power to deliver devastating cuts. The reinforced point can be put to severe tests without failing: its hollow ground section helps penetration through tougher materials and may even have been able to break through some types of armor in a well aimed and powerful thrust. Although the Romans are known to have favored the point in close quarter fighting, they never abstained from the efficient use of cuts when the opportunity arose. We may learn some insight about how the sword was used and how soldiers were trained from the writings of Roman historians. "A stroke with the edges, though made with ever so much force, seldom kills, as the vital parts of the body are defended both by the bones and armor. On the contrary, a stab, though it penetrates but two inches, is generally fatal. Besides in the attitude of striking, it is impossible to avoid exposing the right arm and side; but on the other hand, the body is covered while a thrust is given, and the adversary receives the point before he sees the sword. " "...Holding their sword straight out, they would strike their opponents in the groin, pierce their sides, and drive their blows through their breasts into their vitals. And if they saw any of them keeping these parts of the body protected, they would cut the tendons of their knees or ankles and topple them to the ground roaring and biting their shields and uttering cries resembling the howling of wild beasts…"
"We are informed by the writings of the ancients that, among their other exercises, they had that of the post. They gave their recruits round bucklers woven with willows, twice as heavy as those used on real service, and wooden swords double the weight of the common ones. They exercised them with these at the post both morning and afternoon. This is an invention of the greatest use, not only to soldiers, but also to gladiators. No man of either profession ever distinguished himself in the circus or field of battle, who was not perfect in this kind of exercise. Every soldier, therefore, fixed a post firmly in the ground, about the height of six feet. Against this, as against a real enemy, the recruit was exercised with the above mentioned arms, as it were with the common shield and sword, sometimes aiming At the head or face, sometimes at the sides, at others endeavoring to strike at the thighs or legs. He was instructed in what manner to advance and retire, and in short how to take every advantage of his adversary; but was thus above all particularly cautioned not to lay himself open to his antagonist while aiming his stroke at him." We can see how the cut was accepted as a perfectly viable method to dispatch an opponent, if the thrust did not prove effective. A crippling cut against the backside of the leg came in handy as a nasty surprise to an over confident opponent. Our Trajan has a blade with the subtle waist and reinforced point found on the best examples of the type. It is based on the famous Guttmann gladius that is now exhibited in the Royal Armouries in Leeds. We hilt this blade with guard, grip and pommel crafted from walnut that has ben soaked in linseed oil for 24 hours. After 48 hours of hardening the surface can be polished to a satin sheen that brings out the shifting hues and deepens the natural color to a dark brown and honey quality. The form of the hilt is as deceptively simple as the blade: shape and size of guard, grip and pommel makes for a ergonomic design that provides the warrior with a clear awareness of the sword even when adrenalin surges through the veins as he faces his enemy. The facetted grip makes for a secure grip and gives a clear indication of the direction of the edge. The shaping of the hilt is like a firm handshake as you grasp the sword more firmly.